Blue Collar expat writes the other Jones Diary. With cross-cultural hubby and little Millie in tow, our adventures from the U.S to Serbia are fare game. How do we protect our expat children? 3 years ago Source: How do we protect our expatÂ children? 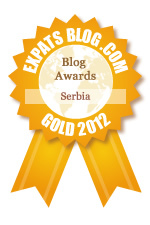 ExpatsBlog.com Expat Blog Awards 2012: Serbia Gold Award! This blog won the Gold Award for best expat blog in Serbia! Tina is such a great person and writer .I have followed her blog and travels from the start.I can't wait to read the next one .It shows a side of the population that do travel from home to home,country to country.It is easy to relate to by all who read it .Can't wait for the coming years adventures. I love this blog and the writers honesty in sharing openly the struggles of being an expat. Learning and living in a new culture is not for faint of heart and this blog thus provides companionship of sorts to many who are expats themselves. Bravo to the author. I get a vivid view of Serbian country life through the eyes of an American when reading Ms. T's Chronicles. Very realistic and charming. I am always left wanting to read more. Tina's blogs help us stay in touch! She is very expressive as she writes. It makes us feel like we are right there with her! Her pictures are amazing and it helps us that are here in the USA to see how her life is at her "other" home. Seeing Millie grow up in pictures is going to be amazing! Keep them coming Tina...We love you! Excellent photos and explanation of life in Serbia! I enjoy all of the posts. I have enjoyed this blog every since the first story. While reading, I feel like I am right next to the writer! I absolutely love her stories. I love reading about Serbia from an outsiders perspective. Super job with the pics and reviews in Balkan life. Can't wait to read the next excerpt. Chronicles of Serbia ha ,did not think this was gonna be so interesting but after reading them all I was thriled and couldnt wait for next one to come. (T u shuld post them every day:)).Love the honesty that u put into text.Pictures r great and i adore Mili,hope that book will come out soon!!Love!!! Tina has an amazing ability to portray life in a very positive way. I have followed her blog since she started it and look forward to each one! I love the pictures too! Excellent job Tina. It's always a pleasure reading your stories. Got a completlyew picture of a country I knew very little about. Thanks so much for helping educate me on a country I was never interested in befor. Amazing blog with intersting captures and stories. Tina's joy of discovery wherever she goes makes this a favorite blog of mine. I would never have known about Serbian life without it, and I appreciate her honesty and willingness to share the ups and downs of expat life. I look forward to reading new blogs every time Tina posts them. I love hearing about everyday life in Serbia and the pictures that accompany all their adventures.